Korean car brands are coming on leaps and bounds, but SsangYong has always lagged behind Kia and Hyundai. That’s all set to change with the Tivoli, though – it is better made, better to drive and offers better value-for-money than any other SsangYong to date. It is a serious alternative to cars like the Nissan Juke and Renault Captur. £12,950 gets you the basic 1.6-litre petrol SE, which comes with 16-inch alloy wheels, air conditioning, cruise control, stop/start, Bluetooth and seven airbags. The only similar car at this price is the C4 Cactus, but for £13,000 you only get a 75PS engine and no air con. But it's the higher trim grades where the Tivoli makes the most sense. For £14,600 you can get the EX model, which has heated leather seats, dual zone climate control, a seven-inch touchscreen and a reversing camera. Moving to top-spec ELX models gets you auto lights and wipers, front and rear parking sensors, styling extras and a TomTom seven-inch navigation system, all for £16,000. Even if you opt for the diesel engine, automatic gearbox and four-wheel drive the price is still less than £20,000. That is a lot of car for the money. Of course it would all be for nought if the Tivoli was crude and badly made – but it isn’t. The neat, attractively laid out cabin is almost as good as you’d find in other Korean cars and that is genuine praise these days. The centre stack is sensibly laid out and the plastics are plush and durable. It might not be an exceptional interior, but it’s as good as its rivals from Renault and Nissan. One area in which the Tivoli excels is practicality. The back row is spacious enough to easily accomoate two adults, or three at a push. There is also a large, well shaped boot with a maximum capacity of 423 litres or even more with the seats folded. There are also numerous cubby holes and storage bins including a central box big enough for a tablet computer and a glovebox capable of swallowing a laptop. As a family car it is hard to fault. Buyers can choose between a 1.6-litre petrol and a 1.6-litre diesel engine, though for the first few months only the petrol will be available. Both engines are available linked to either a six-speed manual or six-speed automatic transmission, plus there is the option of all-wheel drive. At the initial launch we only got to drive the front-wheel drive petrol. The peak power figure of 128PS might look ample on paper, but this engine has no turbocharger and consequently it makes its peak torque of 160Nm high in the rev range, meaning it needs to be worked hard to deliver useful performance. Thankfully the manual gearbox is smooth and precise, so changing up and down isn’t as much of a chore as it could be. The automatic gearbox, which is shared with the current MINI, is fine too but it also suffers for the lack of torque and often needs to kick down through two gears when climbing hills or overtaking. The petrol engine also lags behind rivals when it comes to emissions, which are 149g/km at their lowest - some way behind rivals like the Nissan Juke DIG-T which manages 129g/km. The Nissan is more frugal, too, with an official figure of 50.4mpg versus 44.1mpg for the Tivoli. On the upside the forthcoming diesel engine will be much more competitive, with emissions predicted to be from 113g/km. That equates to economy of around 66mpg, though final numbers are to be confirmed. The diesel also produces a more useful peak torque figure of 300Nm, so it should prove more flexible on the road than the petrol. The rest of the driving experience is perfectly acceptable but it’s far from memorable. The Tivoli is easy and relaxed on the road, but the suspension could do a better job of quietly and comfortably absorbing broken road surfaces. Through corners there’s little to say about the car – it works well enough, with an acceptable amount of body roll and enough grip to satisfy the average driver. The steering is accurate and easy to get on with but offers little feedback and isn’t particularly rewarding. Its weight can be adjusted, with normal, sport and comfort settings, but it’s fairly light in all three and best left in the standard ‘normal’ setting most of the time – though ‘comfort’ might be handy when parking. While it might not be particularly engaging, the Tivoli is still a very easy car to drive and, when you consider the price, practicality and equipment it offers, a few flaws with its driving dynamics are a reasonable sacrifice. The Tivoli marks a massive leap forward for SsangYong and, despite a few shortcomings, it gives the brand genuine credibility in the face of stiff competition. 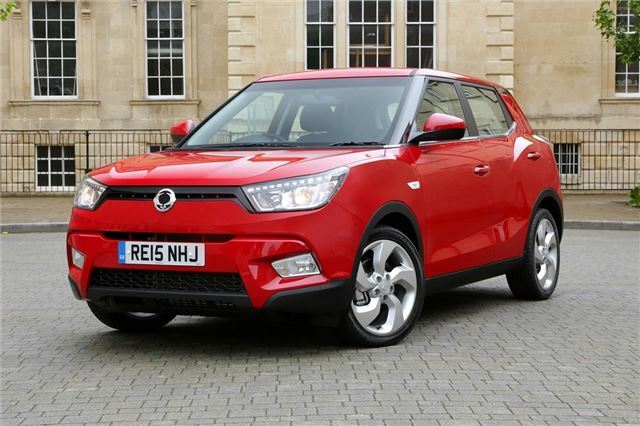 The SsangYong Tivoli is available to order now with front wheel drive and a petrol engine. Diesel and all-wheel drive models arrive September 2015.